Inazuma Eleven the Movie is the most satisfying and exciting tie-in piece of media ever made. Having come out at a point where the franchise hadn't overly reused the plot of "people from the future want to destroy soccer so they have to stop them", it takes that concept and refines the raw passion that the early part of the series instilled onto the viewer and made it even more potent by making most of the movie a recap. The idea of more than half the movie being events the viewer has probably already seen is exactly what makes it so great: fans will be reminded of what moments shaped Endou and the team's beliefs about what soccer is, building up to what is originally the defining moment of that journey being the match against Zeus academy but switching them out with the even more fearsome foes from the future. Raimon's match against Ogre perfectly embodies the appeal of Inazuma Eleven: the flashy moves, the bonds the characters have formed by going through thick and thin together, the breath-taking moments where they turn things around no matter how hopeless it seems. Ogre academy itself couldn't have been a better foil to Endou and his friends because of their misguided idea of strength and what is necessary to achieve peace. This match takes the character defining moment that was supposed to be in its place and adapts it into a series defining moment by upping the scales and ending with the most intense climax the anime as a whole ever had. To cap it all off, the credits roll and along with it is a series of photographs of every team and individuals they had met along their 130 episode long journey. Whether it be allies or even foes: they're all shown along the main character, smiling, laughing, and being glad that they got to enjoy a nice game of soccer together. For the viewer, now having spent an hour and a half engraving Endou's iconic catchphrase and the feelings and history behind it into their hearts, seeing this credit sequence couldn't be any more satisfying. Story (7): One of the weakest Points of this movie. 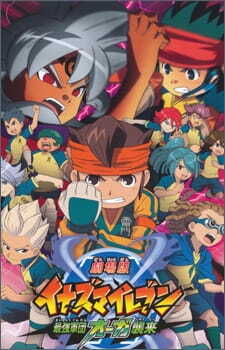 Endou Mamoru Revives the Soccer Club, and many scenes of the first season... Admiral Hibiki and Several others recruit the Ogres to facing Raimon. Art (10): This is the best... I liking the Style of the movie and the Hissatsu Wazzas looking very Awesome... I Liked the introduction of the members from the future. Sound (9): A nice Job with the music is notable. But Many Tracks are remixed or Changed with some new music. And the Voices fits with the characters. And addition. T-Pistonz+KMC Songs are Cool and Great. Characters (8): Other of the Weakest parts, The lot of characters are the same, The Ogres (In Majority are too Ugly...), But Kanon and Baddap Looks very nice. Enjoyment (8): I Liked the movie and I enjoyed it... But the Story is too Repetitive and the Hisatssu are Great. The story certainly isn't bad at all, but it's a lot that I have already seen in the serie of inazuma eleven. Altough I must say that I really enjoyed the serie. The part of the movie that I hadn't seen yet also wasn't very original. It's just that the team is attacked by evil persons, not very original, but I still liked it. The art is almost the same as in the serie, I've seen better, but it's all right. The sound was good, I don't really have anything to say about it. The only thing is that the sound fits well with the situations. I already liked the characters because of the series. They are sometimes really pessimistic and sometimes really optimistic and cheerfull. Even when the movie wasn't that new, I still enjoyed watching it. The part that was new, was pretty good, and it brought back the smile that I had on my face while watching the serie.